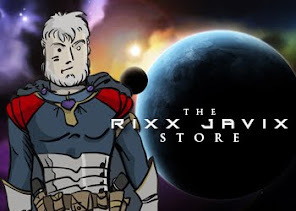 No, not that real Rixx Javix. For those hoping for a post opening the door to my "real life" identity, this isn't that post. Not that my RL identity is a secret exactly, anyone with a modicum of internet skill can figure it out for themselves... I'm not actually hiding it or anything. No, this post is about an experiment I tried awhile back with my in-game identity. I thought it could be interesting to try and create a photo-realistic version of his portrait. The idea intrigued me, and since a small measure of "huh" is all I need to do something, I thought it was worthy of a good try. It ended up being more difficult than I thought it would be. Now, for those of you who are thinking the obvious (3D) at this point, let me state my position. I love 3D. I used to be a proficient modeler myself, I did some pretty cool work with Electric Image back in the day. As well as other pieces of software that you won't know and that will only make me sound older than I actually am. Suffice to say, I can use 3D and sometimes do. But no matter how good the model is, it isn't the same as working with an actual photo. And that was the effect I was looking for in this project. Did I achieve it? Sorta. Like I said it was harder than I initially thought it would be. The first problem was finding a subject to shoot that was close to RJ. I found a friend of mine that agreed to be the model. 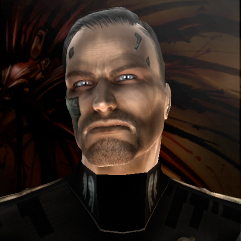 It was then that I discovered a fundamental fact, the character creator in Eve is distorted. Or at least the version I used to create Rixx in the first place. It is extremely difficult to get a human head to do that twisted, arrogant, flexed, bent in the middle, look that Rixx is famous for. Even using warp tools and other tricks. So eventually I gave up. It is close. Given the right motivation I might try again some day. But probably not. In the end I think it was a worthy effort and an interesting experiment. The point wasn't to re-create the in-game portrait exactly anyway, but to create a real world version of it. And in that sense, I think it worked. I'd be curious to hear what you think?